Bolton Street Deli & Liquor provides a full range of groceries, from condiments and bread, through beverages and honey, to chocolate and wine. 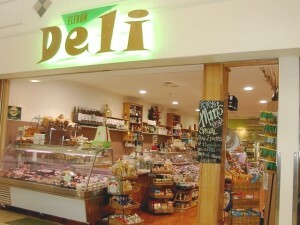 They also sell a wide range of cheeses, meats, dips and homemade produce in their deli section. Gluten-free and organic products are available. 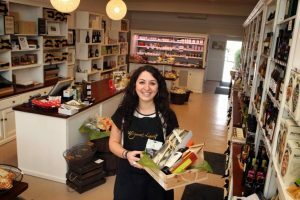 They are THE major stockist of local food products in North East Melbourne, with products from around 20 local producers. They also serve coffee, breakfast, snacks and lunch from 7am daily (8am on Sundays). Some examples of food options include soup, pasta dishes and moussaka. A comprehensive range of meats, cheeses, organic and gluten-free products. Also, platters, heat ‘n’ serve meals and made-to-order hampers. Gourmet Living is a premium food store (and online shop) specialising in high quality individual products and hampers. They stock an exciting range of Australian produce and wine, along with selected artisan European brands. They also love food and love to cook, so they run regular cooking classes. Their hampers are all packaged in sophisticated and elegant gift boxes finished with a black bow. 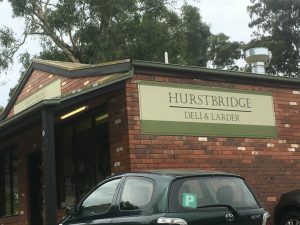 Hurstbridge Deli & Larder is a delicatessen and kitchen offering home style cooked meals, lunches and coffee. They have lots of delicious food such as pasta (fresh homemade as well as dry and frozen), pasta sauces, antipasto, soft & hard cheeses, smoked products, frozen pies, pastries and a small range of specialty meats such as gammon, Irish sausages, steak & double smoked bacon. Much of their food is either homemade or locally sourced. They also do hampers, platters and catering for special occasions to suit all budgets. They are open 6 days a week: Mon–Fri 8am–6.30pm and Sat 8.30am-6pm. Products: Cabernet Sauvignon, Cabernets, Chardonnay, Gewurztraminer, Pinot Noir, Rosé, Shiraz, Apple Brandy and Tawny Port. Also, cider and beer. Local outlets: Cellar door – Thursday to Monday, 10am-5pm (closed on Thursdays in Winter). Call them (9722 1304) to find out if any sellers near you. 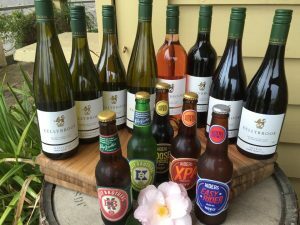 Kellybrook produces a range of wines, ciders (branded Kelly Brothers) and beers (branded Riders Brew Co.). Their wines include Shiraz, Cabernets, Pinot Noir, Rosé, Chardonnay, Cabernet Sauvignon and Gewurztraminer, as well as Apple Brandy and Tawny Port. Their ciders include Sparkling, Apple and Pear. Their beers include Golden / Summer Ale, American Pale Ale and Porter. Darren and Farley Kelly founded Kellybrook Winery in 1962, starting with cider and then moving onto wine in the 1970s. 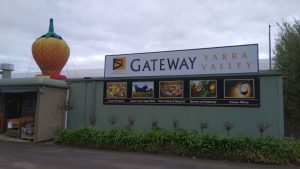 It was the first winery in the Yarra Valley to receive it’s Vigneron Licence and Cellar Door licence (1969) and it is one of the few wineries in the Yarra Valley still owned by the original family. Set amongst lush vineyards and historic gardens, the winery offers an authentic Yarra Valley tasting and working farm experience. A large range of wines, beers, ciders and local produce are available for tasting and sale. Picnics and grazing plates featuring local produce are also available all day. The gardens feature a 125-year-old oak tree which is listed with the National Trust, as well as roses, salvias and bulbs. On the last Sunday of each month, ‘Sunday Sessions’ are held with live, local music from 1.30-4pm and hot food from the kitchen. Over the first weekend in May, there is the annual Kellybrook Cider Festival, soon to be in its 30th year. That’s Amore Cheese cheeses are made using cow or buffalo milk locally sourced in Victoria. Giorgio Linguanti grew up in Italy and migrated to Australia in 2004. Without a word of English, he got a job in a cheese factory where his interest and passion for making cheese ignited. After his experience in two different cheese factories, Giorgio started his own business, That’s Amore Cheese, in 2008. He began with just one product – bocconcini leaf – but was soon also making burrata and smoked scarmorza. In 2010, That’s Amore Cheese took over Donnybrook’s cheese factory and, in 2015, they moved into a larger facility in Thomastown, which includes a retail outlet. In their shop/deli, you can find their entire artisan cheese product range made daily in their factory right next door, along with high quality Italian cured meats, olives, local, other cheeses (local and imported), Italian products and fresh bread. You can get ricotta calda (hot ricotta) until 10 am every day. There is also a little cafe where you can enjoy coffee, porchetta, pasta, gnocchi, pizza and different kinds of hot dishes (or take away). 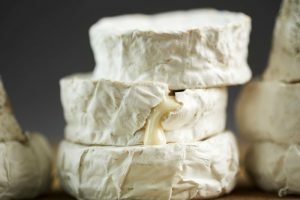 Most of Yarra Valley Dairy’s cheeses are fresh, soft style cheeses made in a style that reflects the farmhouse cheese of France and Italy, although their mature cheeses have also become an important part of their range. The cheeses are made from cow’s milk from nearby Yarra Valley dairy farms and goat’s milk from Gippsland. 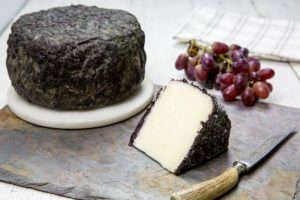 All of their cheeses are available for purchase in their Cheese Shop, alongside a range of carefully selected regional produce and local wines. Cheese plates, together with locally baked fresh breads and various regionally produced charcuterie items, are also available to purchase and eat in. The Cheese Shop is open 10.30am-5:00pm every day (except Christmas Day), and is located in a 100 year-old milking shed with beautiful views of the Yarra Valley. You can also view the making of the cheese through a viewing window.